A dance social is dance activity organized for dancers by dancers - it's a place simply to enjoy music and dancing, and also to network and mingle with fellow dancers and friends. What differentiates socials from other dance occasions is that they shed the club mystique and often the profit motive, to create an atmosphere where dancers of all levels can really do their thing. Socials have a relaxed atmosphere and you never have to worry about when the next Salsa will come. It also tends to be much easier to dance with that guy or girl whom before looked like they were way too advanced to dance with at the club. Usually held on weekends either in local halls or dance studios, socials tend to have events like performances from local or guest performers as well as community dances like "birthday dance" which help introduce everyone. Socials are all about bringing together the Salsa community an creating a place for it to grow! Over the last decade, Salsa has swept across the globe, spreading from the burroughs of New York City to countries such as Canada, the UK, Singapore, Japan and even Russia, to name a few. In every major market city, you can find salseros and salseras, dancing On1, On2, and Casino Rueda, on almost every night of the week. Even in the smaller cities, communities are coming to life where there is strong love for salsa music and dance. Our goal is to bring that love for the music and the dance to the Capital Region. Furthermore we want to host an event where dancers from local and out of town studios, can come together to dance, relax and have fun. Capital Region Salsa Social (CRSS) is organized and run by a group of salsa enthusiasts who would like to grow, enrich and spread out the wonder that is salsa dancing to the Capital Region. These volunteers come from varying backgrounds, ethnicities and cultures, and all share the common love for all genres of Latin music and dance. 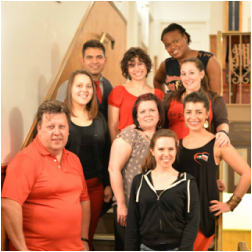 All of the proceeds we gather are put right back into the Capital Region community of salsa dancers. We keep nothing for ourselves. For the most part, all proceeds are used to pay for premier salsa instructors from around the country to lead workshops, dazzle us with their performances, and show us how far we can really go with salsa if we so desire.